I know it is still early to think about snow coming to West Michigan and Grand Rapids and we are more concerned with mowing our lawn. 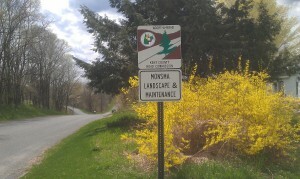 However, Monsma Landscape & Maintenance want to offer you an early bird special. At this time we are offering a 10% discount to new customers in the Grand Rapids area who prepay their seasonal snow plowing before September 15th, 2013. If you need a quote on snowplowing or snow removal services, please contact us 616-868-5767 or simply fill in the form to the right as soon as possible for a no obligation quote. We offer a full range of snow management services including snow removal, plowing and shoveling in the Ada, Lowell, Cascade, Grand Rapids, Comstock Park and Rockford area. We have a hard working crew who will clear your driveway, walkway before you leave your home for the day to ensure your safety and peace of mind. Ugly brown lawns Grand Rapids? Grand Rapids and West Michigan homeowners do about their ugly brown lawn? Everyone of our customers in the Grand Rapids area wants a lush, dense, green turf even during these dog days of summer. Fact of the matter is that we have a very hot spell of weather coming to West Michigan and no rain in sight. So what do we do about our ugly brown lawn? With the heat lately you may need to actually double your sprinkling times to keep things looking good. Remember that a slow deep soaking is more beneficial that a quick blast that will probably flow away from the plant. Some plants like Coreopsis are prone to mildew if they stay wet too long, so don’t water them late in the day. The same goes for turf. Early morning watering is best. You may want to hit it again 12 hours later making sure it can dry before dark. One drawback to watering in the heat is water loss through evaporation. Timing is everything… when you water will effect the amount you water. Another option would be to keep sprinkling at the same time but double the duration. Attention…property owners in Grand Rapids, due to this long hot spell without rain, make sure to raise your blade when lawn mowing to avoid your grass from scorching or burning in the hot sun. How Does Your Garden Grow Grand Rapids? Its great to have a garden and see tidy rows of sprouting veggies. You have this high level of satisfaction until the weeds rear their ugly heads. What can you do? Also see the round about where Comstock Blvd, Union and Aberdeen N E meet, this area has been beautified courtesy of MLM. LANSING, Michigan (May 7, 2013) – The Governor has proclaimed that during the month of May we raise awareness of the positive economic and environmental impacts that the nursery and landscape industry has had, and continues to have, in the Great Lakes State; and encourages residents to Plant Michigan Green by visiting a local retail garden center, planting a tree, having a landscape or lawn installed, or simply taking time to enjoy the beauty of Michigan’s greenery. For more information on how you can participate to help the environment, to find a professional, and to Plant Michigan Green go to www.PlantMichiganGreen.com. The Michigan Nursery & Landscape Association was established in 1922 and is the statewide trade association representing over 5,000 nursery, perennial plant production, Christmas tree, sod producers, landscaping, and lawn care firms that are the fifth largest nursery industry in the nation, the largest specialty crop in the state, and provides significant impact on the state’s economy accruing a total of approximately $5.715 billion each year and employing over 36,000 Michigan citizens. 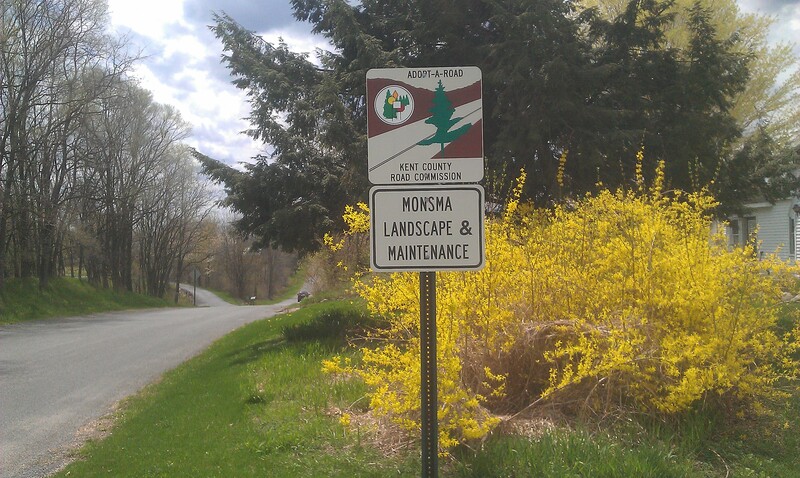 Why Should I Hire a Monsma Landscape & Maintenance, Grand Rapids? In your busy life you probably don’t want to spend your leisure hours making your property look its best. Delegate what you can and do what you enjoy. Our job is to let you Live Better Outdoors! As your landscape and lawn care professionals, we care about our work and treat your property with the utmost care and respect. We also have decades of experience to do the job right the first time. We have the heavy equipment to perform your lawn care and landscaping efficiently and safely with the best possible results. Proper use of fertilizers and herbicides is an important part of plant health and vigor. 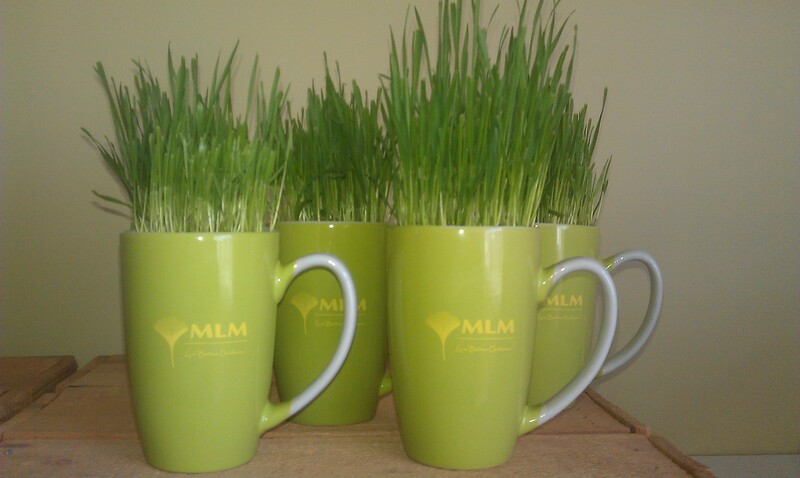 MLM applicators are certified and licensed by the State of Michigan; keeping your health and safety top priority. Management of storm water has become a hot topic country wide and in West Michigan. The principles used for installing permeable hardscapes are the same as typical hardscape installations. There are many attractive product lines that absorb rainfall while reducing runoff. Through the use of permeable pavers in Grand Rapids area driveways and parking areas, the amount of storm water that reaches water treatment systems can be reduced. This will save money for municipalities and keep our lakes cleaner. Porous pavements detain storm water and allow it to slowly add to the ground water levels and mimic the natural water cycle. Paved surfaces used for vehicle traffic catch some of the pollutants that flow into streams and lakes with the storm water. Permeable pavers filter suspended solids, nutrients, and metals through the crushed stone base and aid in the break down of contaminants. Experience has shown that even though the initial installation costs more, permeable pavers have maintenance costs that are 30% less than asphalt. Permeable pavers that are sown with grass seed have a lower surface temperature than asphalt. Porous pavers look great! The open areas of these pavers can have soil and grass seed added to give a very unique look. Over 90% of rainfall events are of half an inch less. Much of this rainfall can be handled by permeable pavers. By showing your clients the benefits you can add more green to your bottom line. 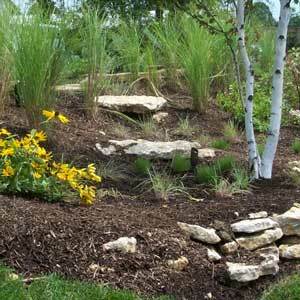 WHY SHOULD WE HAVE RAIN GARDENS in Grand Rapids, Michigan? With all the rain that we have had in the last week you’ve probably been wondering where does all the water go and what pollution is carrying with it. Before the days of pavement most of the water was absorbed back into the aquafier where it fell. Today with pavement and pipes the water is transported into our rivers and lakes along with the residue from our cars. Rain Gardens slow the flow of runoff as temporary reservoirs designed to contain, filter, and absorb the water keeping it from the storm sewer. Properly designed rain gardens can be amazingly beautiful features of the landscape. They are also a source of entertainment for the owners and home to many butterflies beneficial insects and songbirds. Rain gardens are meant to filter the runoff rapidly, meaning the water drains within 24 hours of the storm. For proper filtration you need the right mix of about 50% sand, 20% soil, and 30% compost. No topsoil is needed for sites of heavy clay. Care must be taken during construction to minimize soil compaction in the rain garden by equipment and foot traffic. Different plant species will be needed for the low level, mid level, and top level of the rain garden. Conditions of sun and shade will influence the selection process. And you will want to top it off with 3 inches of mulch to keep the plants moist during dry spells and to help discourage weeds. Cover Evergreen shrubs and trees provide area to hide and rest. Water Yes, birds get thirsty too!